In that spirit (ho ho! 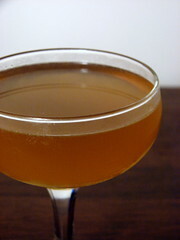 ), I’m offering up the Ruirita, a rhubarby twist on the Margarita. First, lemme give you fools the recipe, and then I’ll tell you how I came up with it and which unsuspecting dolts I thieved my ideas from. So! Shake over ice. Rinse chilled glass with orange flower water. Pour the flower water into the sink, and fill glass with love. Now, I had been thinking about this drink over the weekend, trying to decide what I wanted to do. I remembered the rhubarb bitters Jen bought me a few months ago, and how I hadn’t really used them much. I then started thinking how I’d like to try them with tequila. Off to Google! However, Jacob did point me in another direction that I wanted to explore–Cynar artichoke bitter liqueur. Yes, artichoke and rhubarb. Jacob’s post mentions a drink that Robert Simonson discussed last year. Robert’s quaff inspired me to try Cynar and rhubarb, but it was my own warped psyche that led to the tequila, rhubarb, and artichoke delight. Jen and I love Cynar, and I don’t think I make enough opportunities to play with it. The final element that I cribbed from another blogger was the orange flower water. A post on Kaiser Penguin has a drink with a glass rinse of the rhubarb bitters and the flower water. I wanted the orange to hint of the orange liqueur you normally find in a margarita, but orange flower water can quickly overpower a drink, so I chose the rinse. Rinses tend to engage the nose more so than the taste buds, so that seemed the way to go. However, I wanted the rhubarb bitters incorporated into the flavor of the drink, so I didn’t use them in the rinse. So, I built the Ruirita in a mixing glass, stirring and tasting. I added the tequila, Cynar, lime, and bitters first, not wanting to deviate far from a traditional margarita. But Cynar’s more bitter than a Cointreau or another triple sec, so I needed a bit of sweetness. I didn’t want to add another liqueur–frankly, with tequila, Cynar, rhubarb, lime, and orange, there’s already enough going on with the drink’s flavor. So I added a touch of simple syrup, to provide neutral sweetening. So, try it please, and let me know what the hell you think. This sounds like a wonderful potion! Just got myself a bottle of Cynar, so I’ll have to try this one out. Drinking this now and it’s very tasty. Never would have thought of putting lime and Cynar together, but it works! One of the best tequila drinks i’ve had in a while, thanks! Yes!!! THIS is why God made rhubarb bitters. What a fragile but compelling complexity. Where can i find your other mixological creations? Right here? Right here is good. Thanks! Do you think you could have obtained the sweetness by adding a pinch of salt to bring out the sweetness in the Cynar rather than adding the simple syrup? Not enough that we would taste the salt up front. I’ll give it a shot and let you know. That is an excellent suggestion. Please let me know! I recreated the Ruirita recipe above tonight as written, and a second without the simple syrup and substituted a pinch of kosher salt. In comparing the two, your recipe with simple syrup seemed more balanced overall, with a hint of bitters on the finish. My variation with salt had a little more citrus upfront, but had a pleasant “sweetness” and interaction between the Cynar and the rhubarb bitters throughout. I think I preferred the variation. Try it out and see what you think! Just curious how you came up with the brilliant name of this drink?